Core wire: 16AWG. Food & Grocery(17). New Arrivals. Tablets & eBook Readers(10). Sales unit: 10 m. Other(262). Based in Osaka, Japan. Automotive & Industrial(9). Belen 9497 speaker cable, Belden 9497 speaker wire Belden MKII, Belden MKII studio. Up for sale is the highly prized Belden 9497 speaker cable twisted speaker wire. Known in Japan as Belden Studio MKII and Belden 9497 in the USA. Legendary Audio cable for speakers/Legendäres Audiokabel für Lautsprecher. Ich verschicke auch weltweit. Know in Japan as Belden Studio MKII and Belden 9497 Made in the USA. No cheap solder and no cheap banana plugs here all handmade and finished in the bespoke ways of old. Best of Luck. Excellent cable. Know in Japan as Belden Studio MKII and Belden 9497 in the USA. No cheap solder and no cheap banana plugs here all handmade and finished in the bespoke ways of old. Best of Luck. Excellent cable. Outstanding, very clean and transparent, just what you want in Speaker Cable. HighEndAudioAuctions Ships Worldwide Studio MKII SALE!! Core wire: 16AWG. Food & Grocery(17). New Arrivals. Tablets & eBook Readers(10). Other(262). Based in Osaka, Japan. Automotive & Industrial(9). Sports & Outdoors(9). Belden 9497 Made in USA wire. Belen 9497 speaker cable, Belden 9497 speaker wire Belden MKII, Belden MKII studio. Known in Japan as Belden Studio MKII and Belden 9497 in the USA. Up for sale is the highly prized Belden 9497 twisted speaker wire in 8 foot lengths for a set of speakers. Known in Japan as Belden Studio MKII and Belden 9497 in the USA. Excellent cable. Outstanding, very clean and transparent, just what you want in Speaker Cable. Love this wire! Known in Japan as Belden Studio MKII and Belden 9497 in the USA. Up for sale is the highly prized Belden 9497 twisted pair speaker wire. Excellent cable. Outstanding, very clean and transparent, just what you want in Speaker Cable. Belden 9497 Made in USA wire. Belen 9497 speaker cable, Belden 9497 speaker wire Belden MKII, Belden MKII studio. Known in Japan as Belden Studio MKII and Belden 9497 in the USA. Excellent cable. Outstanding, very clean and transparent, just what you want in Speaker Cable. Belden 9497 10 ft Speaker Cables , For Vintage tube stereo with Legendary Tone! Know in Japan as Belden Studio MKII and Belden 9497 in the USA. A Pair of Legendary Belden 9497 speaker cables in 10' foot lengths. For sale is a pair of Legendary Belden 9497 speaker cables in 10' foot lengths. Belden 9497 Made in USA wire. Belen 9497 speaker cable, Belden 9497 speaker wire Belden MKII, Belden MKII studio. Known in Japan as Belden Studio MKII and Belden 9497 in the USA. 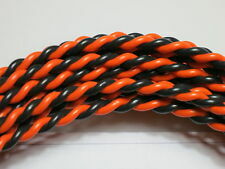 Up for sale is the highly prized Belden 9497 twisted speaker wire in 10 foot lengths for a Pair of speakers. We use World famous Belden 9497 wire, Audioquest SureGrip BFA Banana Plugs and Cardas Quad Eutectic Solder. The Best Belden 9497 Speaker Cables you can buy! - Genuine Made in USA Belden 9497 speaker wire. Belden 9497 Made in USA wire. Belen 9497 speaker cable, Belden 9497 speaker wire Belden MKII, Belden MKII studio. Know in Japan as Belden Studio MKII and Belden 9497 in the USA. Up for sale is the highly prized Belden 9497 twisted pair. Know in Japan as Belden Studio MKII and Belden 9497 in the USA. A Pair of Legendary Belden 9497 speaker cables in 30' foot lengths. For sale is a pair of Legendary Belden 9497 speaker cables in a 30 foot lengths. Belden 9497 10M Speaker Cable Cord Electric Audio. It is raw, cable only sale. Core wire: 16 AWG. Belden 9497 5 meter Speaker Cables For Vintage tube stereo with Legendary Tone! Core wire: 16AWG. We are Japanese. Know in Japan as Belden Studio MKII and Belden 9497 in the USA. A Pair of Legendary Belden 9497 speaker cables in 8' foot lengths. For sale is a pair of Legendary Belden 9497 speaker cables in 8' foot lengths. Know in Japan as Belden Studio MKII and Belden 9497 in the USA. A Pair of Legendary Belden 9497 speaker cables in 20' foot lengths. For sale is a pair of Legendary Belden 9497 speaker cables in a 20 foot lengths. Core wire: 16AWG. Our Products are 100% Authentic. 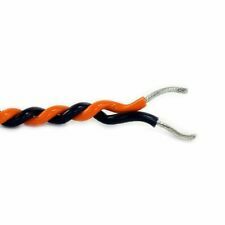 Cable: BELDEN 9497. 9497 Speaker cable popular as audio cable. Banana plug: Dual screw gold plated plug. Solder the end of the cable with solder, screw of banana plug. I attach it to the banana plug and send it out. Belden 9497 speaker cable Cotton Jacket DH Labs gold Spades soldered with Mundorf silver / gold solder. Belden 9497 USA made cable. Burn In with Nordost Audio Vidar. DH-Labs Gold Plated Copper Spades. Belden 9497 Made in USA wire. Belen 9497 speaker cable, Belden 9497 speaker wire Belden MKII, Belden MKII studio. Know in Japan as Belden Studio MKII and Belden 9497 in the USA. Up for sale is the highly prized Belden 9497 twisted speaker wire in a 15 foot Pair as shown in first picture for a set of speakers.